So the VGX’s came and went and while it seems that not everyone was particularly thrilled with all aspects of the show, many eyes were on Reggie Fils-Aime and just what he was going to show. 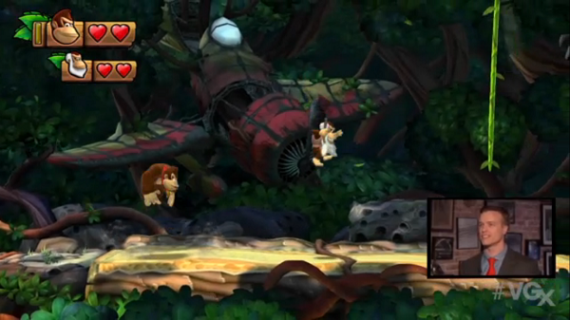 Much of the speculation proved to be correct when Mr. Fils-Aime, flanked by Vance from Retro Studios, made the announcement that Cranky Kong would be a playable character in Donkey Kong: Tropical Freeze and that the game would launch on February 22, 2014 along with showing gameplay of good ol Donkey Kong and Cranky in action. This drew a decidedly mixed reaction with the culmination of Cranky’s debut being in the fact that he managed to trend on twitter. Now I’m not here to rain on Cranky’s parade because on its own the announcement of Cranky Kong was a very good one. It is certain to draw more interest to Tropical Freeze and serves to further differentiate it from its predecessor Donkey Kong Country Returns on the Wii. Making Cranky Kong a playable character is brilliant and his Scrooge McDuck style mechanics look like they will be a blast to play. However, when viewed within the context of VGX, this was just not the announcement to make. Yes it generated some buzz for Nintendo, but at the expense of cutting themselves off from “core” gamers. The Wii U was still new enough to challenge the ingrained perceptions that some gamers may have towards the company, and the VGX was a very good venue with very good timing to do just that. But when Cranky was trotted out it only served to reinforce them. Given the audience at hand, it would have served both Nintendo and Cranky better to bring him out with a Nintendo Direct. It would have still driven hype (I mean c’mon, it’s Cranky Kong) while leaving the VGXs open for something more audience appropriate like for instance X, where showing even a new trailer would have served not only the VGX audience something more aligned with their preferred style of gaming, but also placated the many Nintendo core audience gamers who are aching for more to be revealed about the much anticipated game. They could have even doubled up, with two gameplay segments split up by Geoff Keighley doing his best to pull more info out of Mr. Fils-Aime, there was certainly room in the segment to fit something else in. Some also are making the observation that what Nintendo showed was “good enough for VGX” referring to the fact that given the quality of the rest of the show, VGX didn’t deserve a good Nintendo announcement. But this only means had Nintendo handled it correctly they would have come out of it looking even better, like they knew how to read their audience, challenge their preconceived notions and demonstrate that they do actually have a gaming experience that isn’t just “mature” but also Nintendo levels of fun. The buzz could have been not just about their announcement, but also about how they “saved” VGX, or how they surprised with an unexpected reveal. It could have been bigger, a lot bigger, Nintendo has a lot of quality games in the works and the fact that they opted to go with a Cranky Kong reveal rather than demonstrate this is baffling. Nintendo isn’t doomed. They didn’t do themselves any favors, and they certainly missed a chance to shake things up, but they have many rabbits left to pull out of their hat. It’s obvious why Nintendo went the Cranky route; ill advised or not, it was the safe conservative route which Nintendo rarely deviates from. But the biggest question looming on the horizon now is whether Donkey, Diddy, Dixie and Cranky have what it takes to push Wii U sales once the holiday boost runs out. While there’s little doubt that the game will sell well, does it have enough of a draw to inspire those that don’t already own a Wii U to purchase one? It could, only time will tell, but Mario Kart and Smash Bros are arguably the bigger system sellers.